In the current 'classic" line-up reunion of GBV, this meeting of the minds might not have meant so much .However, in 2001, 4 years removed from the classic line-up split, Tobin Sprout and Robert Pollard collaborating on fresh tunes was an indie Lennon/McCartney kick in the indie wisdom tooth. In 1997, Pollard reportedly kicked Tobin Sprout out of Guided by Voices (along with the rest of the line-up). The truth being, Tobin Sprout moved to Michigan and thus ended the era. SO, the formation of Airport 5 brought upon much speculation of past gems lost. After all, this was the songwriting duo that collaborated on such classics as "14 Cheerleader Coldfront" for christsakes. Unfortunately, the packaging was flashier than the tunes. Airport 5 never lives up to the hype on paper, nor does it live up to much of anything in the overall picture. 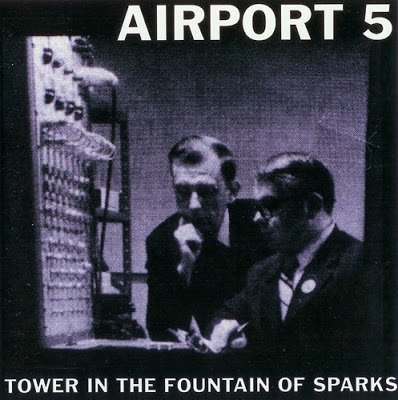 Still, for the hold-on-hopers out there, of the two LPs, Tower In The Fountain Of Sparks is the winner. Burns Carpenter, Man of Science- 4 Very similar music track to “Dayton Ohio 19-Something and 5.” Relaxed tempo with great lead part. Bedroom melodies on the chorus after off-kiletered verses. Killer home-recorded track. A promising start to a pairing of the giants of GBV. Total Exposure- 5 Acoustic guitar with melodic bass-line. Sparse like most of the other Airport 5 stuff. This track is a slow-burner, but can be a soul-burner after repeated listens. Insanely melodic and uplifting track. Classic GBV if pounded out in a live setting, but more pensive here. Subatomic Rain- 2 Dark and ‘80s metal sounding. A moody and dull head trip/ache. One More- 3 Mid-fi, mid-tempo, lolly-gagging expo with Pollard getting a little wild with the title of this song. ONE MORE! Mission Experiences- 1 Short, dull, and drab. Life's short. Don't waste it, kids! The Cost of Shipping Cattle- 3 Heady spoken-word piece over pulsating guitar tremolo and ambient bass lines. A total mood piece that’s great it you hang with it. Don’t use this as any kind of introductory piece for anyone, just own personal enjoyment. And don't operate heavy machinery. Circle of Trim- 3 Spiraling guitar jangle with haunting vocals by a tuneful Uncle Bob. Pretty and affecting. War & Wedding- 4 Great, lounge-in-your recliner vocal hook. More spiraling, guitar reverb! Keep it comin'. It's workin'. It's alive. I'm dead. Stifled Man Casino- 5 GBV material from the slide melodic bass lines, chorus that kills, but backed by the sparse guitar crackle of Airport 5. Most familiar territory on this Airport 5 release in relation to classic Pollard-related material. It's goddamn good. Up the Nails- 4 Acoustic led track with melancholy leads. Mid-tempo and one of the subtly better songs on the LP. This one grows on you over time, and is worth the repeats. Tomorrow You May Rise- 1 Short and dull mood piece. Forgettable. What was I saying? Feathering Clueless (The Exotic Birdman)- 4 Classic late ‘60s inspired spiraling hazy-lazy day song from Sprout. YES! Mansfield on the Sky- 3 Reflective, simple tune with ghostly melodic vocals. Would dream pop be the appropriate term? White Car Creek- 1 Sprout sung cut with space-guitar. Filler track. Nobody cares. Remain Lodging (At Airport 5)- 4 Great vocal melody that oozes regret, loss, but a dash of hope. Exceptional closer to a moody, avant-basement rock project. Damn good album that doesn't sound much like GBV, oddly. I'd like up to buy a Volume 3....Love "Burns Carpenter"
How can anyone not love "Feathering Clueless"? It is, indeed, very hard to be a drone. In a hive of women. still love "Feathering Clueless. And I always will. Just noticed it's exactly one year since I last praised that song. that's either really spooky or just evidence that I spend a disproportionate amount of time commenting on this blog. So hard to be a drone. In a hive of women.